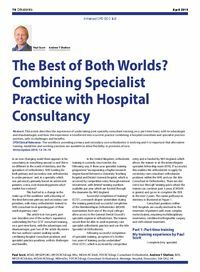 Abstract: This article describes the experience of undertaking post specialty consultant training, on a part-time basis, with its advantages and disadvantages, and how this experience is transferred into a current practice combining a hospital consultant and specialist practice position, with its challenges and benefits. Clinical relevance: The workforce providing primary and secondary care orthodontics is evolving and it is important that alternative training modalities and working practices are available to allow flexibility in provision of care. Author notes: Paul Scott, BChD, MFGDP(UK), MFDS RCS(Eng), MSc, MOrth RCS(Ed), FDS RCS(Eng), Consultant Orthodontist, Andrew T Shelton, BDS, MFDS RCS(Edin), MOrth RCS(Eng), MDentSci, FDS RCS(Eng), Consultant Orthodontist, Montagu Hospital, Doncaster, S64 OAZ, UK. Objective: To outline how providing flexible working practices, combining specialist practice with hospital consultancy, can not only benefit the employers involved, but also help in the provision of care.